Brass is one of the earliest alloys known to man. It is durable and has a golden hue to it. Being affordable and having looks like gold are two properties enough for it to become a favorite metal for people to decorate their home with. 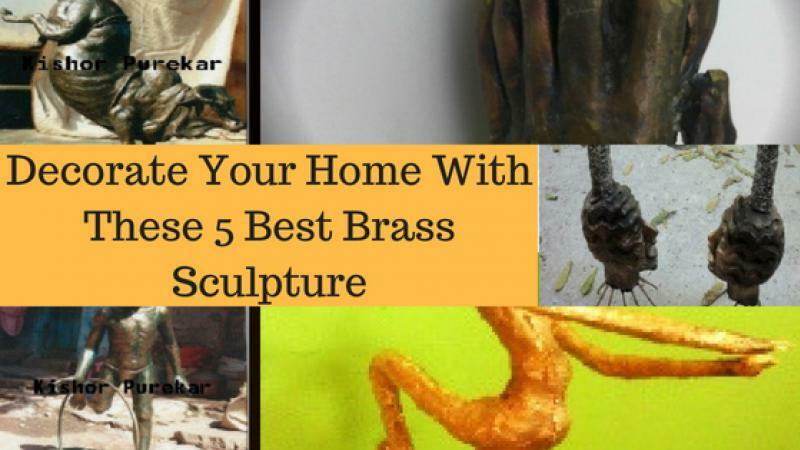 Decorating your home with brass sculptures is always a good idea. It gives a personality to a home. The most common metal sculptures to be found are in brass. And there are many online and traditional metal art galleries that let you buy brass sculptures online. Are you searching for some of the best brass sculptures for sale? This brass sculpture of a face covered by the palm and seems to cry is created by Sculptor Floriamo Urs. You can buy this sculpture on ShowFlipper for $4990.68 here. Through this sculpture, the sculptor wants to tell that crying is okay and there is no wrong in hiding your tears. He who searches the meaning of life is a searcher. Human beings are born and they die and again the cycle repeats. The search for meaning makes sure that one life is enough if used wisely. Buy this brass sculpture by Jyotsna Hande for $672.21 here. The bull is the king of the farmland. Without the bull, agriculture cannot happen. In the villages of Maharashtra, bull is celebrated with a unique festival dedicated only to bulls. They pray bulls to help them and bless them with a bountiful season of harvest. Sculptor Kishor Purekar celebrates the Bull in this brass sculpture which you can buy from Showflipper\'s online brass sculpture gallery for $500 here. A favorite game of children in the summers just until 25 years ago was driving an empty cycle wheel with a stick along the alleys and roads of the city. Nostalgia is the theme of this sculpture. Gone are the days when children were found playing on the streets with whatever they could improvise to play with. Bring home this nostalgia in the form of this brass sculpture created by sculptor Kishor Purekar for $760 here. Two bodies, one mind! Marriage is an institution which bring about the union of two mindsets, two moods, two bodies, two cultures, two lifestyles. The truly successful marriages are the ones that act and think as one mind. In this sculpture the sculptor beautifully shows this thought with the bridge connecting two heads and which has two separate bodies. Buy this amazing brass-iron sculpture by Jyotsna Hande for $751.12 here. Are you thinking of buying sculptures? Do not hesitate to buy from our online metal sculpture gallery. We at ShowFlipper make sure you get the best and genuine art to buy. Sculptures is a great art form. Sculptors are magicians because they can bring down every minute detail of a face, of a body and of a personality in complete details and minuteness of excellent workmanship. Do you know about any such magical sculpture to decorate home or office with? Do not forget to let us know in the comments section?